On the eve of her new album release, Orianthi appeared at a “Great Guitars” event held at The Grammy Museum to perform songs off her new album (“Heaven In This Hell”) and discuss her career with moderator and Grammy VP Scott Goldman. It was a very good event for both guitar geeks and casual fans (or, in some cases, both). 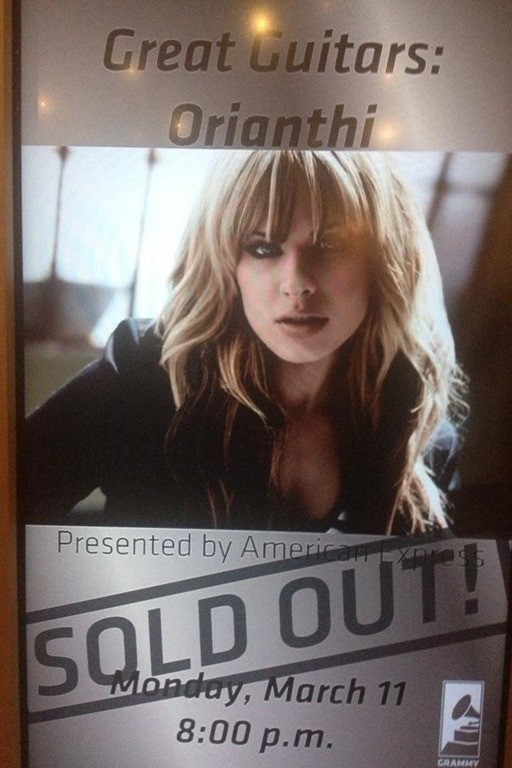 Orianthi quit school at 15 to pursue her guitar playing. She performed in front of a huge crowd with Steve Vai without knowing what songs were being played. That’s pretty cool. She spoke of being a huge fan of Carlos Santana and he is the primary reason she endorses Paul Reed Smith (PRS) Guitars. She said she was a rather normal person when she started touring with Alice Cooper (and thus became the first female member of this band). 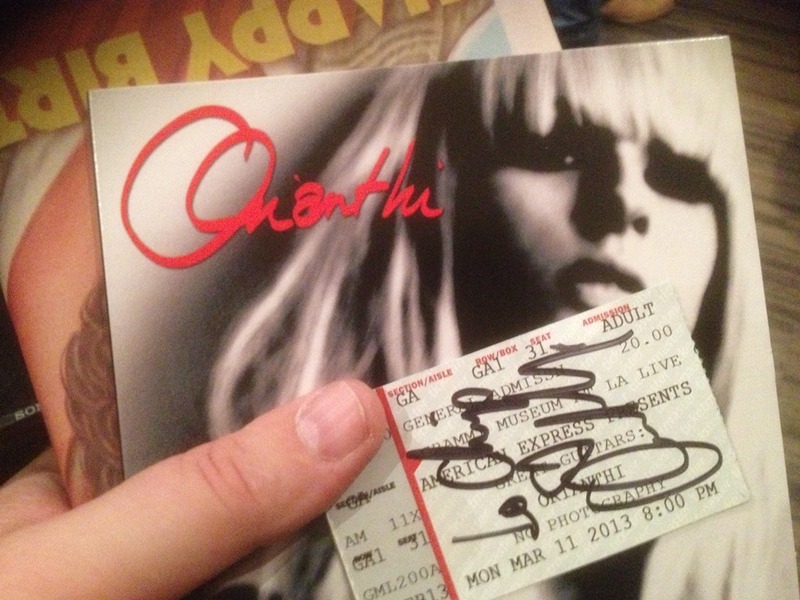 Orianthi explained that she started to get into the stage theatrics of the tour. She now wears fake blood and plays along nicely with the stage act to the point where Alice Cooper calls her “Goryanthi” and “Scaryanthi”. My question was answered quickly during the talk. Alice Cooper has a show in Switzerland this week (mid-week), so what is she doing in LA? It turns out she departed hours after the show to make the Switzerland gig. Funny thing is she has a gig back in Hollywood on Sunday. Go figure. One of the highlights of the presentation was when Michael Bearden, the Musical Director for Michael Jackson’s “This Is It” tour, made an impromptu speech talking about how Orianthi landed the Michael Jackson gig. He explained the buzz from Carlos Santana, her heroic guitar performance with Carrie Underwood at the Grammys and basically explained that she was the one for the highly coveted guitar slot. He gave a great speech and seemed like a really cool guy. After the talk, she got up and played 5 songs. Her vocals are even better than expected these days and she’s even nicely upped her game at guitar playing. Her band was top-notch and she had appearances by Jimmy Z. on the harmonica, who put on quite a display, and a special guitar appearance by Dave Stewart (who sat right next to me during the rest of the event, which was very cool). The band sounded great and the place was hopping. The new songs sound wonderful and her vocals and guitar work make her new release something really worth checking out. 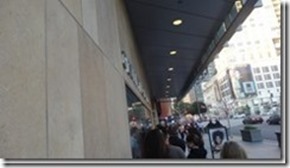 After the show, she signed new CDs in the lobby. She also signed a PRS guitar that was brought in by a young female fan and her parents. That had to have made her week. And she got to see a fan that had her sign his neck at NAMM and turned it into an autograph. That’s dedication. No pictures were allowed during the meet and greet, but an obvious exception was made here. Standing in line to get an autograph, I also happened to notice that “rhythm guitar” is misspelled inside her CD case in the Credits section. I got a chuckle out of that. I’ll be returning for The Whisky show on Sunday!